JUN 1967 - JUN 1967 Attacked by Israeli air and sea units killing 34. The third Liberty (AGTR-5) was laid down under Maritime Commission contract as SS Simmons Victory by Oregon Shipbuilding Corp., Portland, Oreg., 23 February 1945; launched 6 April 1945; sponsored by Mrs. Kenneth L. Cooper; and delivered to the Maritime Commission 4 May 1945. During the closing months of World War II, Simmons Victory was chartered under general agency agreement by Coastwise (Pacific Far East) Line, San Francisco, Calif. After the war, she continued to steam the ocean shipping lanes. She saw considerable service in the Far East during the Korean conflict. On nine different runs between 18 November 1950 and 23 December 1952 she steamed to Korea to supply, and support American forces engaged in repelling Communist aggression in South Korea. Simmons Victory entered the National Defense Reserve Fleet in 1958 and was berthed in Puget Sound at Olympia, Wash. Acquired by the Navy from the Maritime Administration in February 1963, she was delivered to Willamette Iron & Steel Corp., Portland, Oreg., for conversion to a technical research ship. She was renamed Liberty and classified AG-168 on 8 June 1963. 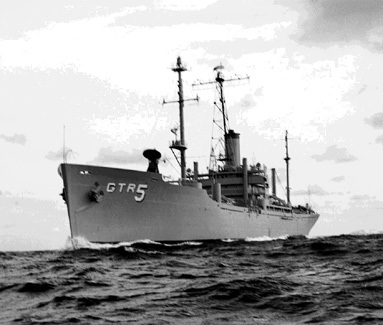 Reclassified AGTR-5 on 1 April 1964, she commissioned at Bremerton, Wash., 30 December 1964, Comdr. Daniel T. Wieland, Jr., in command. After undergoing outfitting at Bremerton, Liberty steamed to the east coast where she arrived Norfolk, Va., 23 February 1965. Assigned to Service Squadron 8, she received specialized electronics and communications equipment, and during April and early May underwent shakedown and intensive training out of Guantanamo Bay, Cuba. Loaded with advanced research and evaluation gear, she possessed the technical capabilities, as well as ready mobility, which made her a valuable contribution to the Navy's comprehensive program of research and development projects in communications. Liberty departed Norfolk 15 June, and during the next 3 months she operated off the western coast of Africa from the Canary Islands to the Cape of Good Hope while supporting research projects. After returning to the Atlantic coast 22 October, she operated out of Norfolk until 4 January 1966 when she again deployed to African waters. During the first 8 months of 1966 she completed two such deployments, and on 1 November she sailed on her fourth cruise as a floating research and development station ship. On 2 June 1967, she sailed from Rota, Spain; and took station approximately 13 miles off the coast of El Arish, Sinai, United Arab Republic on 8 June, the fourth day of the brief Arab-Israeli War. That day, while conducting communications and electronic research operations, she was attacked by jet fighters at 1403 l.t. A bomb hit portside amidships, and two or more Israeli fighters made repeated straffing, fragmentation bomb, and rocket runs over the ship. As a result, three major fires raged topside. At 1424, three motor torpedo boats, flying the Israeli flag, approached at high speed and at 1434 attacked. Three torpedoes were fired; one passed astern, a second may have passed beneath the ship, and the third exploded on the starboard side, forward, tearing a 39-foot-wide hole in the hull; 34 men were killed, 169 were wounded in the aircraft and torpedo boat attacks. Although severely wounded. Comdr. W. L. McGonagle, the commanding officer, remained at the conn to guide the ship out of shallow water. As the gyrocompass was knocked out, and the magnetic compass was of uncertain reliability, Commander McGonagle steered the ship, using its wake and the azimuth of the afternoon sun as reference points. Although the American flag was flying prior to both attacks, Israel maintained the attacks were due to mistaken identity. Navy fighters were launched from the America to provide air cover, and the Washington-Moscow hotline was put to use to prevent any misunderstanding that could have led to a U.S.-Soviet confrontation. Liberty arrived at Valletta, Malta 14 June in company with Little Rock. (CLG-4), America (CVA-66), Davis (DD-937), and Papago (ATF-160). After undergoing repairs, she departed Valletta 16 July for the States in company with Papago. The ships arrived Norfolk 29 July. She entered Norfolk Naval Shipyard 2 March 1968; and 28 June AGTR-5 was placed out of commission in reserve at Norfolk, and assigned to the Norfolk group of the Atlantic Reserve Fleet. Liberty was awarded the Presidential Unit Citation. Captain McGonagle received the Medal of Honor for his gallantry in saving the ship, remaining on the bridge for 17 hours, despite serious wounds, to bring the ship to safe waters.